There’s been a longstanding complicated relationship between sports betting and sports broadcasting, seen in everything from Jimmy the Greek on The NFL Today through countless veiled references to the line (it’s appropriate that one star of those, Brent Musburger, is now talking about gambling daily) through segments like Scott Van Pelt’s “Bad Beats.” Gambling is a huge reason why many watch sports. But given that betting on sports has only been officially legal in very limited areas and ways to date, broadcasters have often touched on it in a somewhat-muted fashion. Now, it looks like that’s about to change. Monday saw the U.S. Supreme Court strike down the federal law prohibiting state-authorized sports betting outside Nevada despite sports leagues’ opposition. That allows for either for new congressional regulation of betting on a federal level or for states to regulate it themselves. Throw in the leagues’ quick shift to arguing for federal regulation rather than prohibition, and it seems likely that sports gambling will become bigger and more accepted soon. There’s probably still going to be a delay as whatever regulations come into play are figured out, but the landscape does seem to be shifting. So, what could that mean for sports broadcasting? Here are a few possibilities. More odds on the tickers. Sports networks’ scrolling tickers often feature pre-game lines, but then shift to scores once games end. But if gambling’s more accepted, it’s not hard to imagine those scores also carrying adjacent information on if the spread was covered or or not, or if the teams combined to hit the over. Strictly betting-focused shows. Some of these exist, such as Musburger’s Vegas Sports and Information Network on Sirius XM and SI TV’s “The Line,” but betting has usually been a more minor presence on traditional sports networks. The closest many have come is shows focused on fantasy, especially daily fantasy, but there’s still a big divide between shows talking about daily fantasy and shows talking about straight-up betting. It’s not hard to see bigger networks like ESPN perhaps bring in shows focused entirely on betting, maybe particularly for college and pro football. Of course, that may depend on how the legalization framework goes; if this is done on a federal level, or if the majority of states find a way to make this work, this is an easier sell on a national network than if this only comes in in a few states. More discussion of the line in NFL preview shows. Again, that depends on how the regulations go, but if betting does become widely legal, it’s not hard to see the NFL preview shows spending more time talking about picks and the line specifically. We could even see a return to the days of bringing in gambling figures like Jimmy the Greek, but with less subterfuge needed about their picks. However, though, a lot of this may depend on how the NFL eventually views this. There’s a long history of that league pushing back and forth on what its rightsholders can and cannot air, even when it comes to fictional shows like Playmakers, and if the NFL remains strongly opposed to gambling, don’t expect the preview shows to challenge it. Less avoidance of NFL betting on other shows. 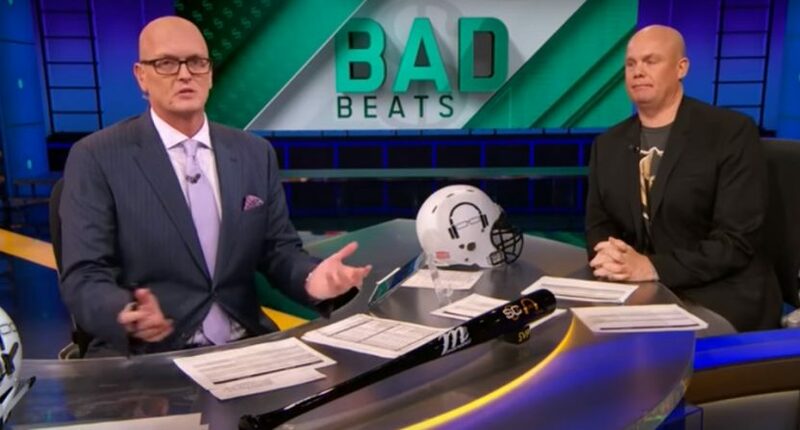 This somewhat ties in to the previous point, but it’s notable that segments like SVP’s “Bad Beats” tend to ignore the NFL, presumably for rightsholder reasons. (There’s been plenty written about the NFL pushing back at ESPN on a whole lot of fronts, so there’s reason for the network to not stir up that particular hornets’ nest unnecessarily.) If sports gambling becomes more widely legal, and if the NFL stops getting mad about it, it’s easy to see that segment discussing NFL content. And that’s not the only one; other editions of SportsCenter could discuss covers and over-unders when relevant to a game, studio shows like Around The Horn and Pardon The Interruption could work in discussion of lines more easily (and even debate shows like First Take might suddenly see Stephen A. Smith and Max Kellerman yelling at each other about the line on a game), and that could be repeated at other networks too. Exclusive window games drawing bigger ratings. The theory with primetime NFL games in particular is that if they’re a compelling enough matchup, many fans who don’t cheer for either of the teams in question will still watch. But that’s not always the case even for a good matchup, and it takes a hit when the schedule produces bad primetime matchups. A lot of the interest in those games, the only game on at a certain time, does come from gamblers, though, and if sports gambling becomes more widely legal and more people get into it, it’s easy to see even a game like this year’s MNF opener (Jets-Lions) drawing more of a crowd than it would otherwise. And that could be extended to even things like Sunday Night Baseball, or to late-round NBA and NHL playoff games. If there’s only one game in a sport on, it seems likely to get a ratings boost from gamblers who like to bet on that sport, and if there are more people gambling, that would seem likely to produce better ratings. Of course, there are a lot of caveats here, and it’s too early to know how much of this will play out. If only a few states legalize gambling and if they do so in ways that aren’t particularly consumer-friendly, we may not see much of an uptick in sports gamblers, and that could limit the desire for new gambling-focused shows and gambling references on other shows. There’s also still quite a bit of pushback to sports gambling, particularly from the leagues, and if those leagues exert influence on their rightsholders, that could limit the changes arising from this decision. And there are still fans who complain about gambling references, and if those voices are loud enough, that could be an incentive to not expand them too dramatically. We’ll see how it all shakes out, but this decision does seem likely to pave the way to a wider embrace of sports gambling, and it does seem probable that networks will at least try to capitalize off that.